Xeikon Café North America, held 17-18 October in Chicago, drew a total of 175 attendees, including a group of press and analyst I was pleased to be invited to join. Attendees included 70 printers and converters, both Xeikon owners and those considering acquiring a Xeikon press. Xeikon reported that this was substantially over target for the fledgling event, which the company plans to reconvene annually. This is part of a growing trend on the part of vendors to the industry to host user events as a way to keep the dialog going with customers, better engage prospects, and update the community on the latest developments. It is also a great way to promote networking, among Xeikon staff, partners, customers and prospects. The company has held several successful Xeikon Café events at its Belgian headquarters, including one earlier this year I had the opportunity to attend. The event was divided into two tracks – commercial print and labels & packaging, reflecting the company’s approximate 50/50 revenue split between the two disciplines. The response from labels & packaging professionals was one of the drivers for larger-than-expected attendance, resulting in that group being divided into two sessions to retain a more intimate and interactive environment. 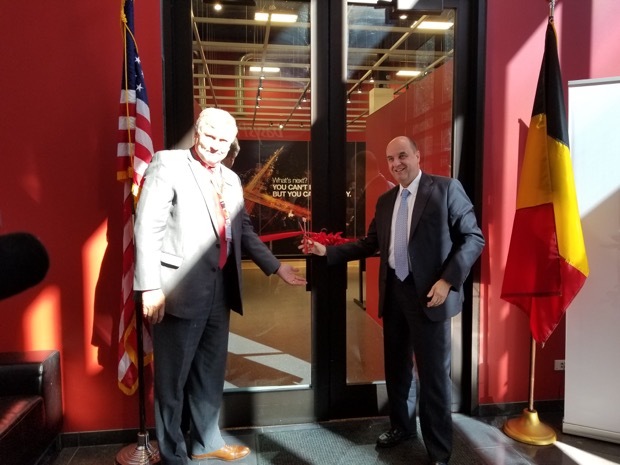 A high point for the small group of media and analysts that attended was attending the official ribbon-cutting ceremony on Tuesday morning for Xeikon’s brand-new Innovation Center, an impressive reconfiguration of the company’s North American demo center. The ceremony was presided over by the company’s new CEO, Benoit Chatelard, with his first 100 days as CEO under his belt, and the North American Vice President of Sales and Marketing, Dave Wilkins. The event coincided with two other major Xeikon announcements – the termination of its Trillium liquid toner project first shown as a technology demonstration at drupa 2012, and the on-boarding of Donna Covannon as Director of Marketing for North America, a position that has been vacant for some time. Covannon has an impressive industry background, most recently with Xerox. Under her leadership, I believe we will be hearing more from Xeikon North America than we have over the past couple of years, and my media colleagues and I are looking forward to working with her. The company is to be congratulated on its straightforward announcement about the Trillium program. So often these technology programs fade out of existence with no explanation. The new Xeikon Innovation Center is quite impressive. It is a showcase for Xeikon’s document and labels & packaging solutions as well as a number of partner solutions and is a well-organized and attractive venue. Each area of the center is dedicated to a particular type of application and each features an overview chart like the one shown below for labels, making it easier for visitors to better understand the company’s strategy and offerings for their segment. 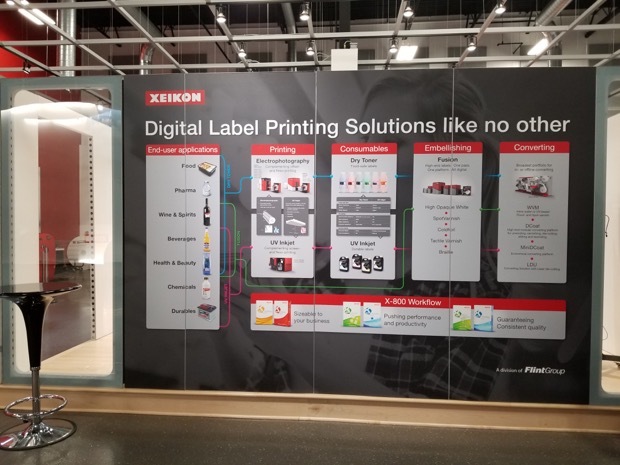 In the case of digital label production, where Xeikon Xeikon has a healthy market presence, the company features its “Fast Felines,” presses based on its Cheetah dry toner technology and its Panther UV inkjet technology, the latter launched earlier this year at the European Xeikon Café. I liked the way the event was organized. Keynote speakers included Jeff Hayzlett, who always has a high-energy approach to presentations that carry great advice for the audience; and our own Dr. Joe Webb, who talked to the audience about the Third Wave of disruption (and opportunity) our industry is currently undergoing. The event was moderated by InfoTrends’ Barb Pellow, who also shared with the audience her thoughts on the state of the industry along with current data from InfoTrends. For me, a highlight of these events is the opportunity to hear from, and interact with, end users and prospective end users, as well as industry influencers. The event featured informative customer panels as well as a panel featuring a freelance designer and an agency owner who shared examples of innovative campaigns and applications that have been enabled by digital printing technology. I also had the opportunity to speak with a number of Xeikon customers and prospects during the event, as well as a private interview with Chatelard and Covannon. In terms of strategic focus, Xeikon traditionally focused on document printing and labels & packaging. There has been a slight shift in that direction, according to Chatelard. Labels and packaging will continue to be a significant focus, and in fact the company’s goal is to be a player there in a bigger way, including heat transfer and in-mould labeling. Chatelard said, “This is a core business for the Flint Group and there is a lot of synergy there. We’ll approach it with two legs – dry toner and inkjet. We are already well-established in labels and have some presence in folding carton. We also will be making some moves into the corrugated post-print market. Those strategies are being worked on now.” One very interesting application that is delivering success is versioned paper beverage cups. This application was shown in Europe and also at this event, and is quite interesting. The company has made a slight shift in its approach to the other side of the business, primarily served by dry toner, and will be focused on the Graphic Arts, in areas with very high value, specialized applications. A good example of that is security printing. Chatelard also called out high end photo books and book covers, wall coverings, advertising, point of sale and high-quality B2 format graphics, carving out a space between high volume inkjet and sheetfed toner. Based on the quality we saw out of their presses during our visit to the Innovation Center, and the throughput these presses can achieve, these goals appear to be pretty realistic. “We’re not saying we will be number one in each segment or that we will have the fastest machine,” Chatelard added. “Our goal in the market is that customers will come to us to get a technology-agnostic opinion about the best way to address their needs. If they trust us, that is the goal.” Along those lines, he reiterated that move to be more of a solutions provider, an aim that was clearly stated last spring at Xeikon Café Europe. This includes the ability to interconnect with other systems to create a more integrated and streamlined workflow. That came out loud and clear at this event. We’ll be keeping an eye on the company’s ongoing progress as they continue to roll out these new strategies.